I have a really bad habit of letting food in the refrigerator go to waste. Especially when it comes to developing recipes. I will buy ingredients with the best intentions of creating something spectacular and then it will languish in the bottom of the vegetable drawer until I discover it a few weeks later when it is beyond redemption. 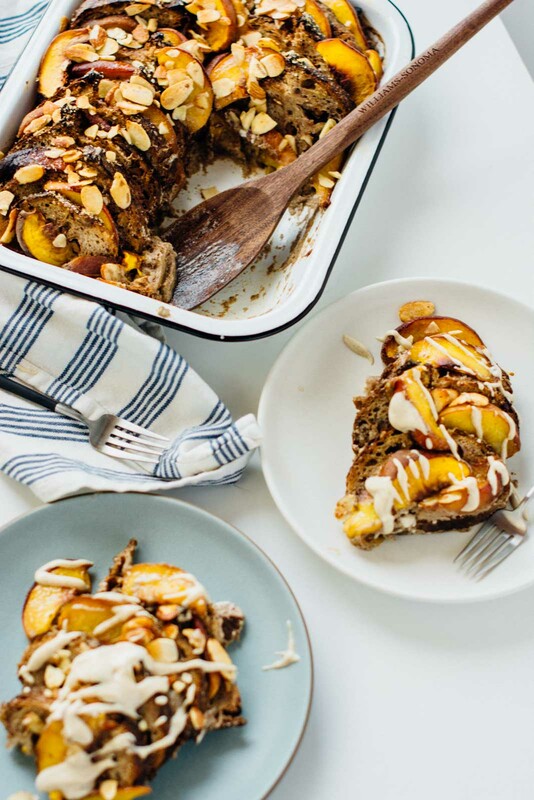 This overnight peach french toast bake was an attempt to change my ways and use ingredients that may be past their prime but could still be used to make something utterly delicious. I am not a breakfast person. Most mornings a cup of coffee keeps me going until lunch. Breakfast is something that I usually skip, mainly due to laziness but I recognize that it’s important for my son to start the day with something nourishing in his body. Making things ahead that we can reheat is the most realistic way for me to ensure that he is starting his day with a full stomach. I love dishes that I can put together the night before. It’s so pleasant to wake up, pop something in the oven without having to worry about dishes and a lot of clean-up. Leftovers should keep for about three days, so we usually get a few meals out of it. 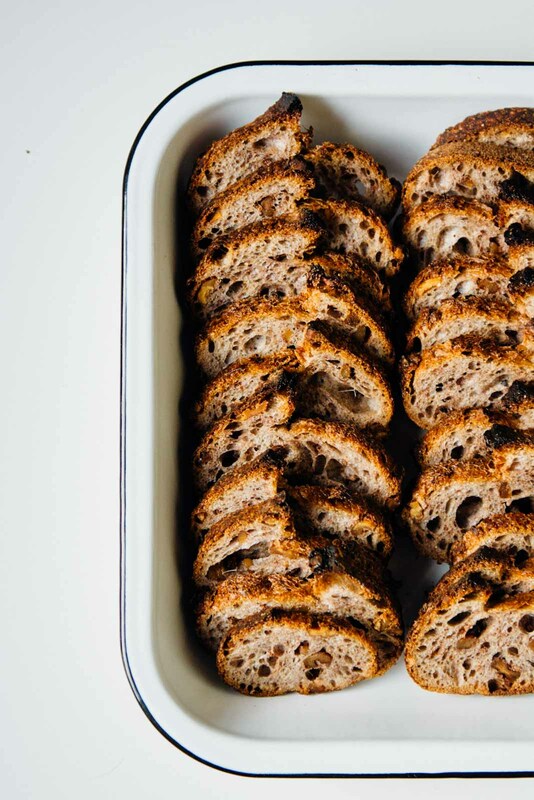 I used a whole grain baguette, but you could use any leftover bread you have in the pantry. To get the consistency of a traditional egg custard, I used some ground chia seeds to thicken the mixture. I also made an updated version of my favorite cashew cream to drizzle over the top, but some maple syrup would be just as delicious. 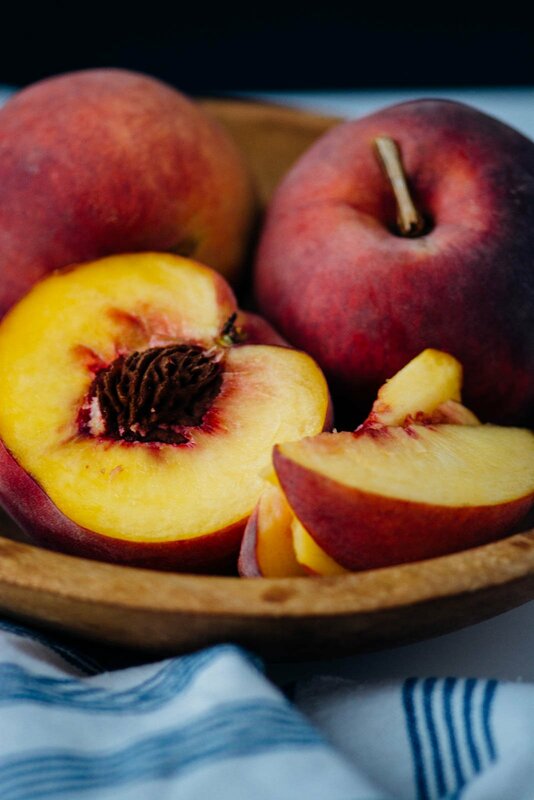 You could easily swap out the peaches for other fruits you have on hand, blueberries, blackberries or any other stone fruit would be great in this as well. 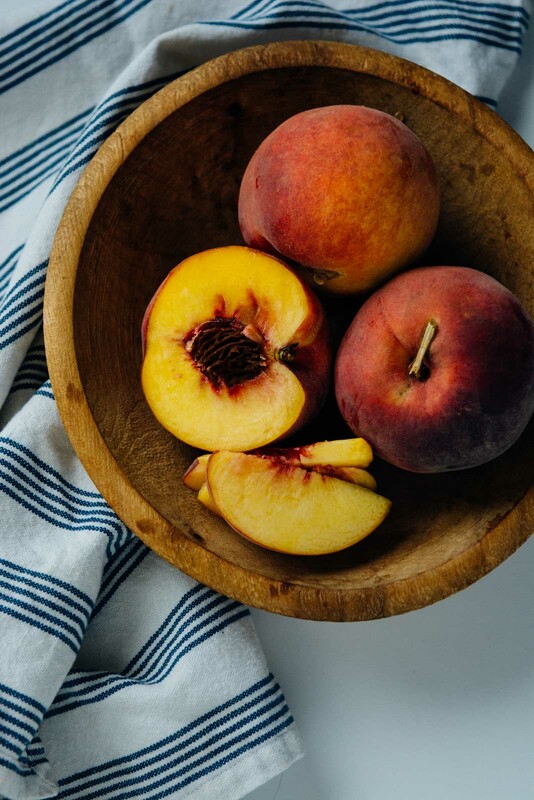 I didn’t peel the peaches before I sliced them but if you want to take the extra step you could score an x on the bottom of the peaches and dip them into a pot of boiling water for a minute and then pop them into an ice bath, the skins will come right off. Life has brought a lot of changes for me lately and I’m trying to come to terms with my new normal. I want to thank all of you that wrote me such kind words. I’m working on developing a new routine for myself and writing this blog is a helpful way for me to focus on something happy and positive. 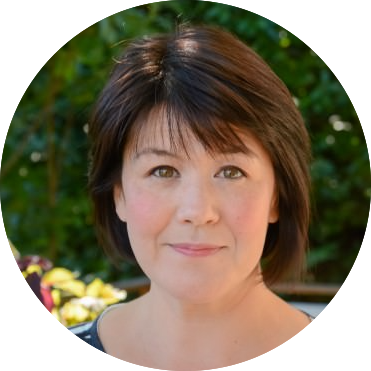 If there is something you’d like to see, I’d love to hear from you! 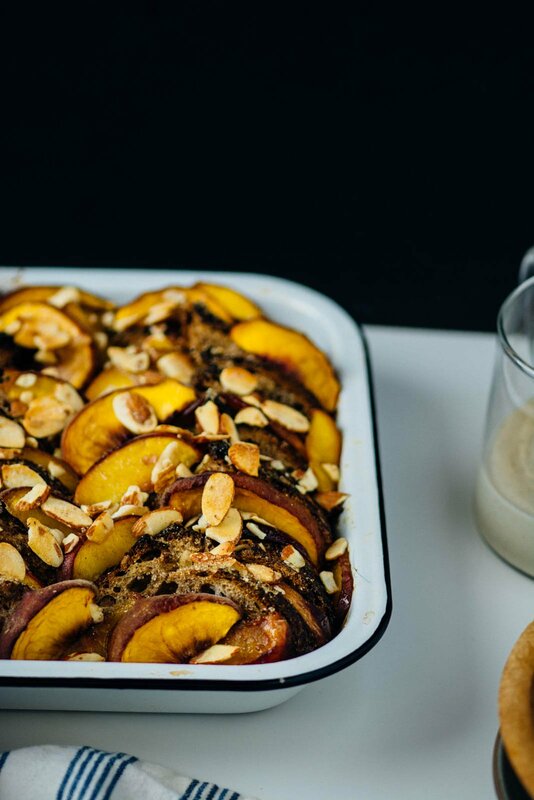 This vegan overnight peach french toast bake is super easy to put together the night before you serve it and all you need to do is pop it in the oven when you are ready to eat! 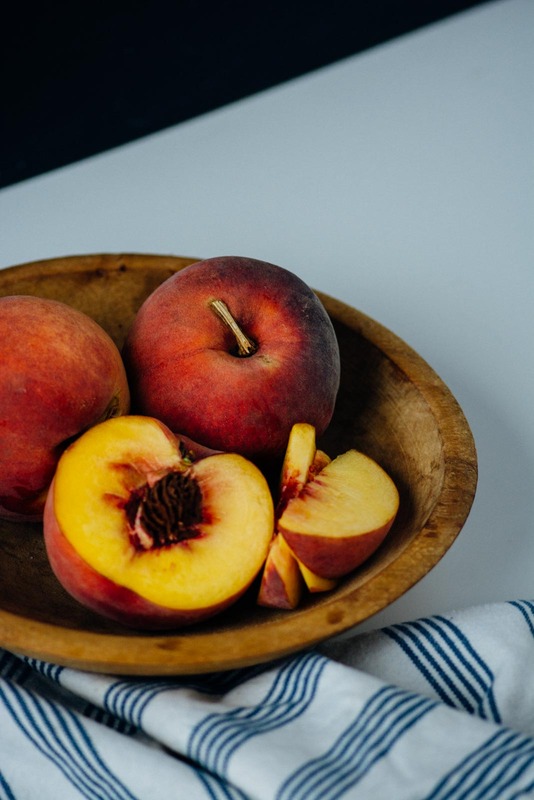 Slice the peaches into wedges, place into a medium bowl and toss with the lemon juice and 2 tablespoons of the turbanido sugar. You can substitute brown sugar if you can't find the turbanido. Set the peaches aside to macerate while you prepare the custard. In a blender combine the almond milk, maple syrup, chia seeds, vanilla extract, cinnamon, cardamom, and salt. Blend on high until smooth and creamy, about 1 minute. Lightly coat a 9x13 baking dish with cooking spray. 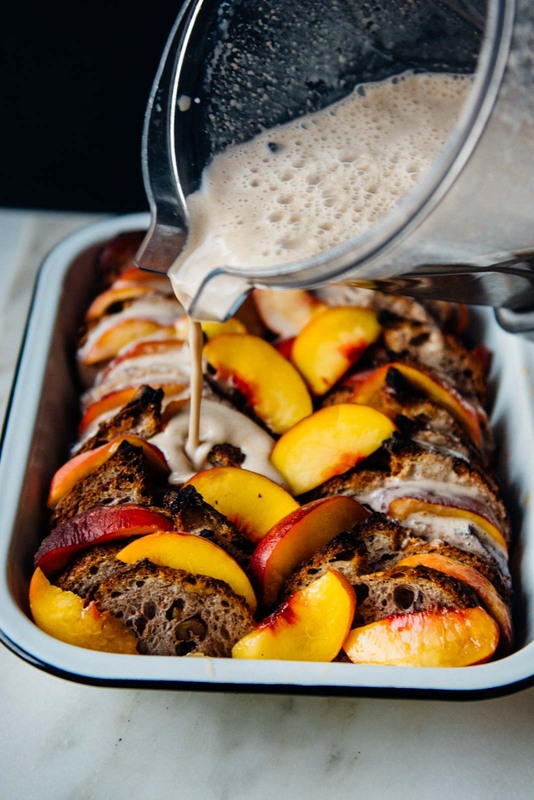 Layer the baguette into the dish, tuck the peaches in between the baguette slices, trying to distribute them as much as possible. Pour the custard mixture over the top, cover and refrigerate overnight. The next morning preheat the oven to 350 degrees. 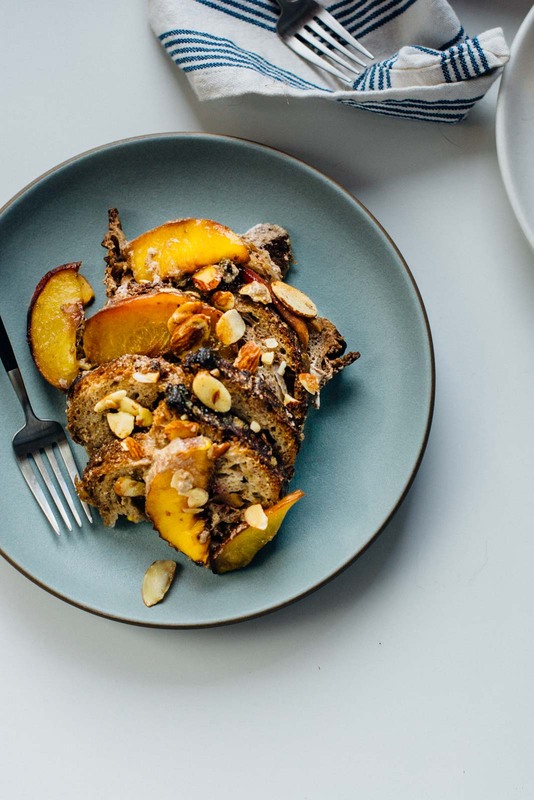 Sprinkle the top of the french toast with the 3 tablespoons of almonds and the remaining two tablespoons of turbanido sugar. Bake uncovered for 35-45 minutes until the top is golden brown. 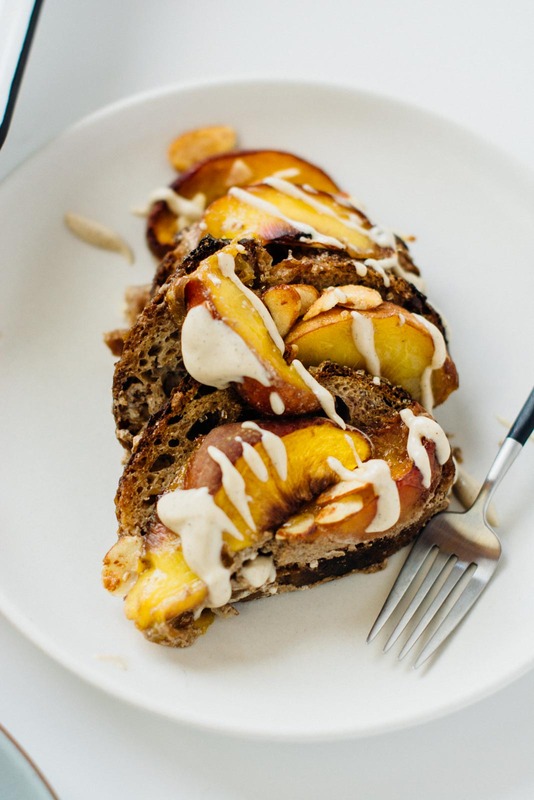 Serve with the cashew cream or additional maple syrup if desired. Cover the cashews with cold water and let them sit for at least 1 hour or up to overnight. Drain and rinse the cashews. Scrape the seeds out of the vanilla bean by slicing it lengthwise and then use the tip of a knife to remove the seeds. Add the cashews, vanilla seeds, almond milk, maple syrup, cardamom and salt to a high-speed blender and process on high until smooth and creamy. 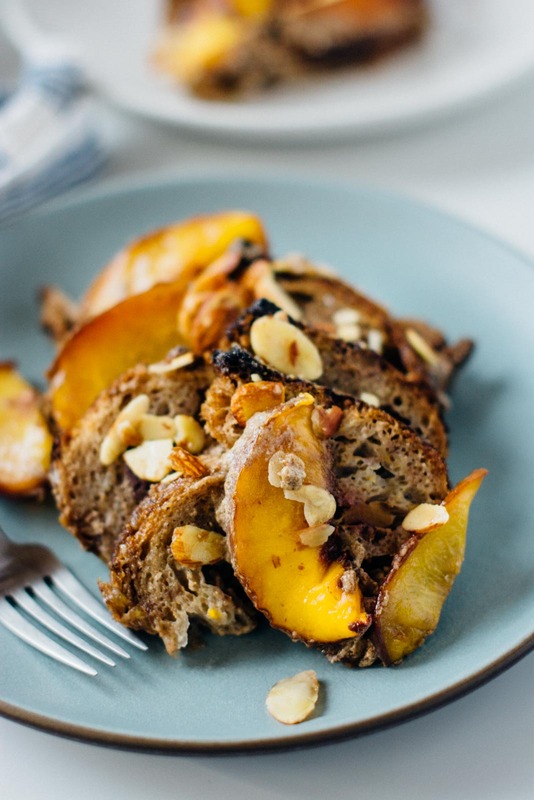 If the mixture is too thick add a tablespoon or two of additional almond milk to achieve the desired consistency. 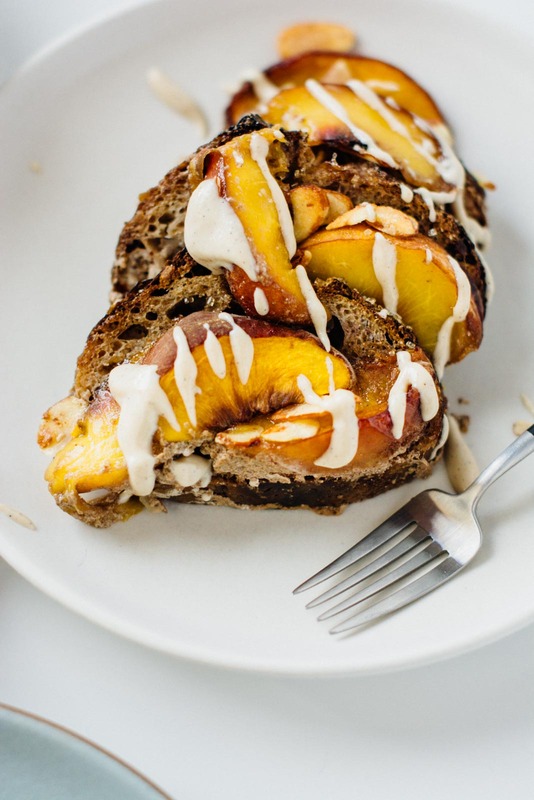 Not a french toast person but this is definitely more my style! 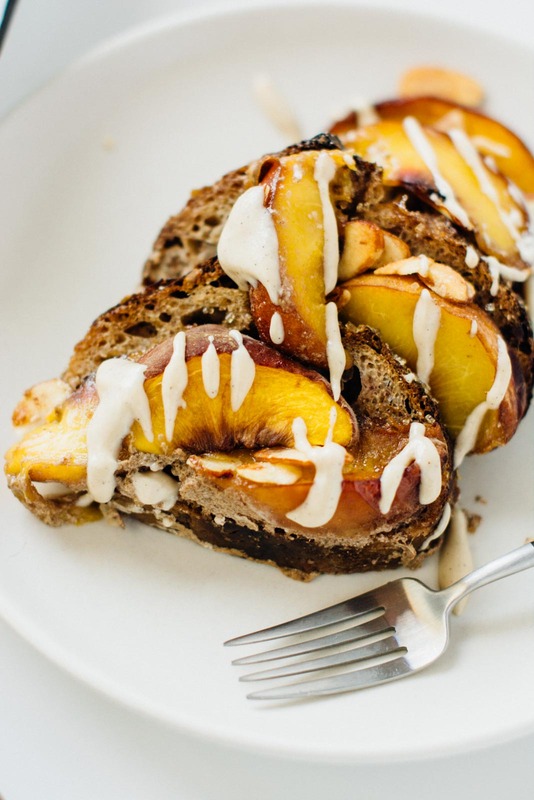 Going on the [home] brunch menu this weekend!